Published in 2013 Grassroots Mapping Forum#4. Order a copy or subscribe online. Only $15/year! Mapping the Gowanus Canal requires innovative techniques to overcome a number of unique challenges. Although we can feasibly take pictures of the canal inland from the Salt Lot, much of the property surrounding the canal is private and not easily accessible. This leaves the public waterway of the canal itself. The Conservancy has partnered with the Gowanus Dredgers Canoe Club, a local nonprofit dedicated to providing waterfront access and education. By incorporating canoes into our methodology, the Conservancy can successfully capture visually stunning and highly informative photos of the canal and its surroundings. The methods are adopted from Grassroots Mapping techniques. Using two tethers, the balloon assembly has more stability and precision when guiding the camera to an appropriate vantage point. On a typical balloon mapping day, we convene at the Salt Lot for a brief overview of the GLAM program and its connection to the overall mission of the Conservancy. Typically, eight volunteers are necessary to map about half of the canal, spanning close to a mile. This includes four people on two canoes guiding the balloon, and two spotters on a third canoe. Two individuals are stationed inland, documenting the process and ensuring the safe transfer of mapping equipment between canoe and shore. Once the balloon is lifted, the first team enters the canal and the team inland passes a spool them. The next team then enters with the second spool. 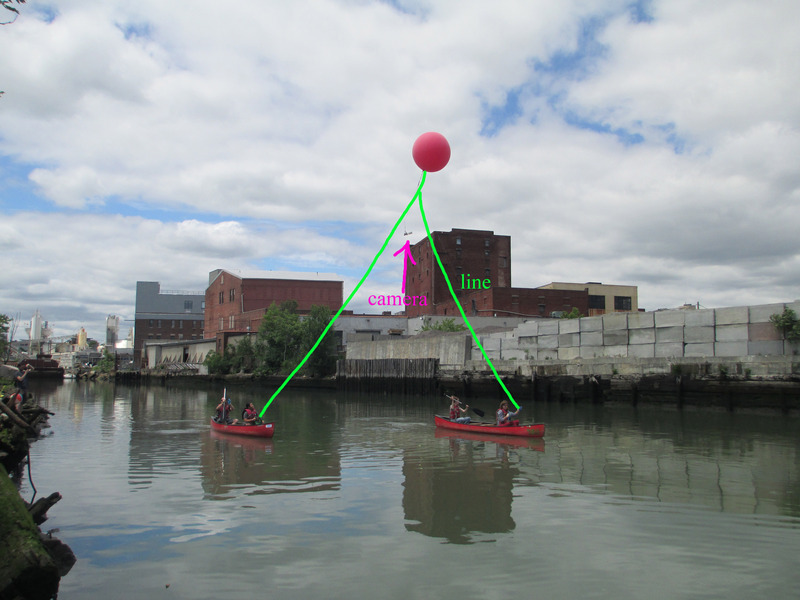 Adding to the challenge of simultaneously balancing a canoe and handling a balloon, there are limited entryways to the canal. The Dredgers fortunately have a dock at 2nd Street, while the Salt Lot’s launching point is a slope of slippery rocks—thus, careful footing and teamwork is essential. Although mapping teams must be aware of bridges, oxygenation pipes, and floating debris, the open channel of the canal actually makes it easier to avoid balloon adversaries such as trees and power lines. Even with these obstacles in place, GLAM has produced high-quality photos that will prove useful as the Conservancy continues to monitor the federally mandated Gowanus Canal cleanup. With more mapping runs, the two-tether methodology will only improve over time.